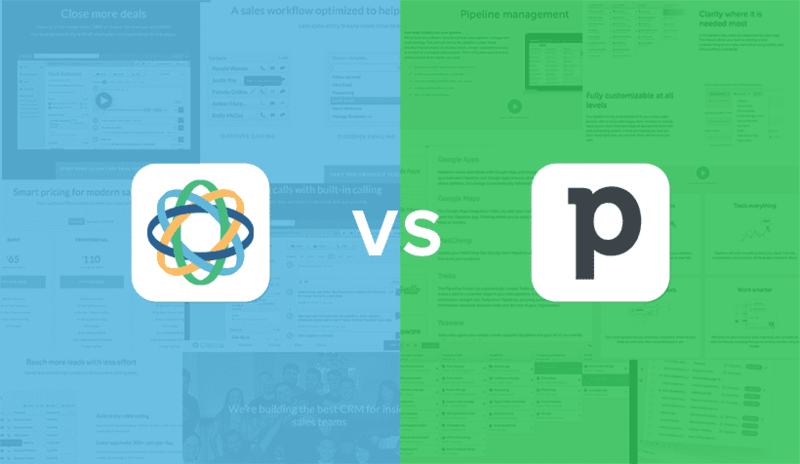 Close.io and Pipedrive are both sales automation solutions with functionality that operates on similar planes. Both aim to streamline the sales process to give reps more time to make calls while offering managers tools to track and forecast performance. However, each provider offers certain features that the other lacks, and in areas of overlapping functionality, one solution might outperform the other. Our goal for this head-to-head comparison is to review each solution’s functionality, and evaluate the use cases for which each solution is best suited. And, if the situation arises, the areas in which one solution simply outperforms the other. Let’s begin. In one corner we have Close.io. Founded in 2013, Close.io was born from a previous venture known as ElasticSales, which modeled itself as a “Sales-as-a-Service” business that built the sales infrastructure to enable companies to scale their sales efforts. The ElasticSales team felt existing technology over-emphasized data entry and couldn’t meet their goals. Following a year and a half of internal development, Close.io (think of a ‘closed’ sale) enabled the sales reps at ElasticSales to improve their workflow and generate millions of dollars in sales for their clients, at which point the company decided the best path forward was to release their internal app to the world. Close.io is headquartered in Palo Alto, California, and its CEO is Steli Efti. In the other corner we have Pipedrive, a New York-based company founded in 2010 by a five-person team with roots in direct sales. Faced with frustration with existing sales automation software, the team collaborated to create a sales management platform. In 2011, Pipedrive joined AngelPad, a startup incubator; by 2017, they’ve raised over $30m in funding and won numerous accolades in various countries. Pipedrive is led by two co-CEOS, Timo Rein and Dominic Butera. Sales reps will spend much of their time staring at these apps; after all, these are geared primarily towards insight sales teams that make plenty of calls, send plenty of emails, and coordinate tasks from a central location. So the app must not only look nice, but offer simple yet effective functionality. Close.io and Pipeline both deliver, but in different ways. Close.io has a visually appealing layout: a vertical panel to the left with links to your Inbox, Opportunities, Leads and Reports, as well as any saved Smart Views, which are specific saved parameters for Close.io’s search function. The better portion of the screen is occupied by the content of the page; for example, the Leads page identifies the company, contact, and lead status along with buttons to email or call them. Each page effectively presents your data with relevant information and functions close at hand. 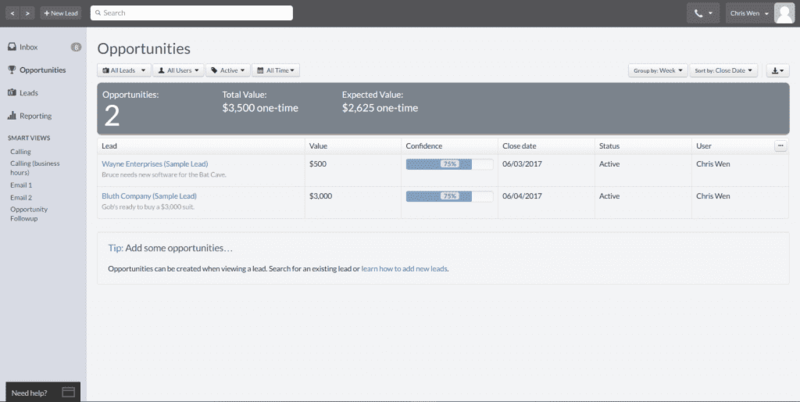 The Opportunities page shows a banner with total opportunities, present value, and expected value; below, leads are listed by company (with recent agent notes), opportunity value, confidence, expected close date, status, and user. There’s a banner across the top with Back and Forward browser-like functions, a button to add new leads, a field for Close.io’s prized search function, a dropdown menu to change phone settings (call functionality is available out of the box), and a dropdown menu in which users access their settings, import leads, invite coworkers, access tech support resources, leave reviews for Close.io on social media or log out. There’s also a popup field available through a button (“Need Help?”) on the bottom left that can be used to send a support request via email. Pipedrive opens up into its Deals dashboard, which by default displays a pipeline view that occupies the breadth of the screen. 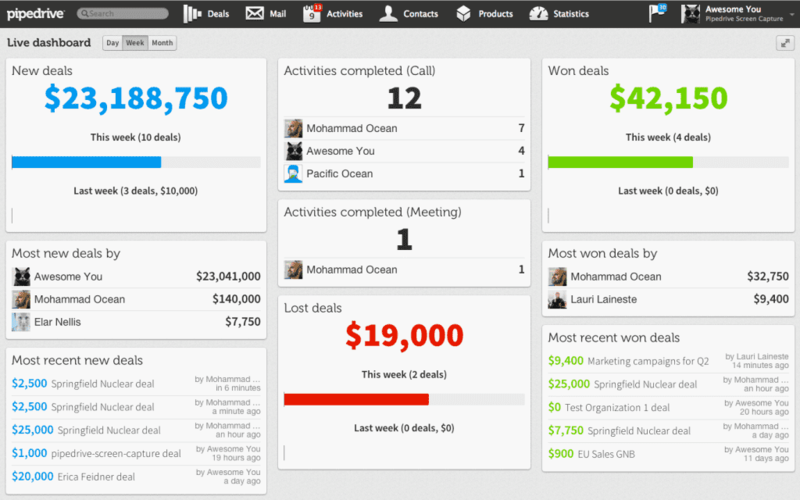 There are three buttons on the top left: two buttons adjust the view to either pipeline or list views, and the third brings you to the Forecast page, which displays sales forecasts by month and is filterable by pipeline, user and default or custom criteria such as deleted deals, open deals, deals older than three months, and so forth. Pipedrive also has a banner across the top of the app with the company’s logo (which is a button that returns you to your default dashboard), a search field, and buttons navigating towards Deals, Mail, Activities, Contacts and Statistics. On the top right, the bell icon shows notifications, and the user’s avatar opens a dropdown menu where users can access their settings, reach out for support, send referrals (for a free month of service) or log out. When clicking on the Contacts button in the top banner, there are actually two pages — one for People and one for Organizations. 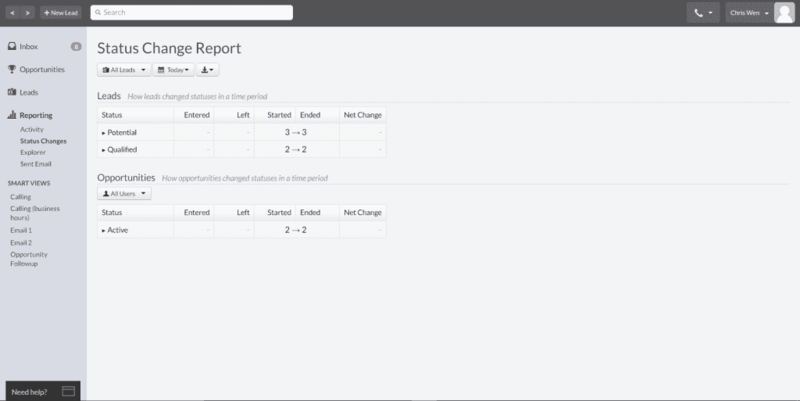 Similarly, when clicking Statistics, users will choose between four separate reporting dashboards — Company, Personal, Reports, and Live Dashboard. 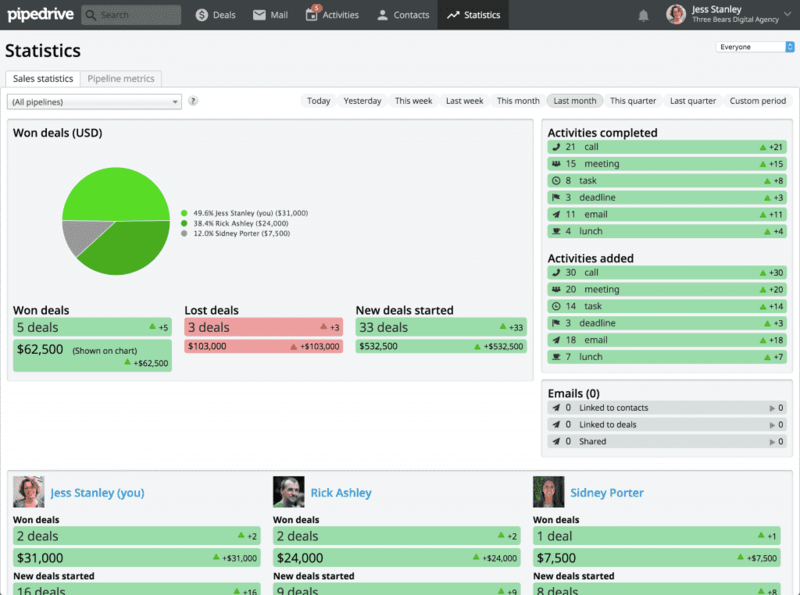 The Company page shows performance and activity statistics across the entire team; the Personal page shows statistics pertaining to the user; the Reports page shows stats according to pipeline, time period, deal size and so forth; the Live Dashboard gives a real-time snapshot of performance and activity according to the day, week or month. User interface and the user experience is fairly subjective, and Close.io and Pipedrive perform similarly in this regard. Visually, they’re comparable; both employ muted colors that are inoffensive to the eye (allowing for longer use without discomfort), though I slightly prefer Close.io’s balance of colors. Pipedrive is largely soft black, white and shades of gray with accents of color for buttons and hyperlinks. Close.io rolls out soft blues and a slightly more modern font. In Pipedrive, users can add Deals (Opportunities) directly, but will need to click on the first text field to make the cursor appear. Users can Tab their way through the remaining fields until they get to the Save button, which creates the deal, or they can click on it. To add a new Contact in Pipedrive, users need to navigate to the Contact button on the top banner, choose People or Organizations, click the green Add person/organization button in the top left corner, and go through a similar process filling out fields and clicking Save. Similarly, if you go to create a lead in Close.io and change your mind, you can click anywhere outside the popup window and the window closes. In Pipedrive, you have to actually click ‘X’ to close the window. While Pipedrive is by no means slow, Close.io is faster and more user-friendly on functions users are expected to use most often — so the win for UX/UI goes to Close.io. An essential function of any sales platform is the ability to manage the pipeline and guide deals through the sales funnel. Of course, all such modern platforms are sales force automation solutions — meaning they should be able to configure (or handle on their own) the automation of time-consuming tasks, notably data entry. Close.io and Pipedrive both have different approaches to this. Close.io doesn’t have a visual sales pipeline like many other sales automation solutions. The omission is certainly deliberate: Close.io bills itself as a “high velocity” sales platform and I doubt they simply forgot about a feature that older CRMs of a more common variety made sure to include. So there isn’t ‘pipeline management’ in Close.io per se; rather, there is Opportunity and Lead management, with Opportunities measured by confidence to close (on a scale up to 100%) and Leads defined by custom statuses which may include ‘Potential’, ‘Bad Fit’, ‘Qualified’ or ‘Customer’. Close.io tracks its users’ activity and offers fairly few fields for data entry so as to reduce the chance of inaccurate data. It consolidates users’ most time-sensitive tasks in the Inbox and automatically notifies team members when tasks are assigned to them. Close.io also offer a degree of email automation. 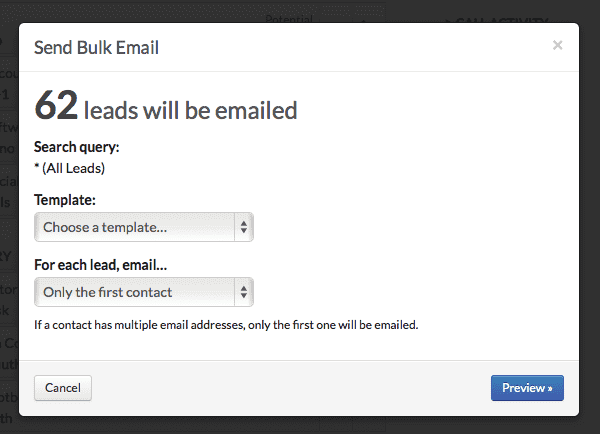 Users can design and bulk send templated emails and automate follow ups. Using Close.io’s search function (specifically Smart Views), users can segment leads and bulk send emails with a few clicks, however the send button must be manually pressed. Close.io will automatically track emails and make available details like when the recipient last opened it, how many times they opened it, and so forth. Close doesn’t seem able to automate task creation, which is a common functionality in many CRMs. Organizations that keep a record of responsibilities through task creation and assignment may find it difficult to switch to Close.io, which seems intended to empower independent sales agents. 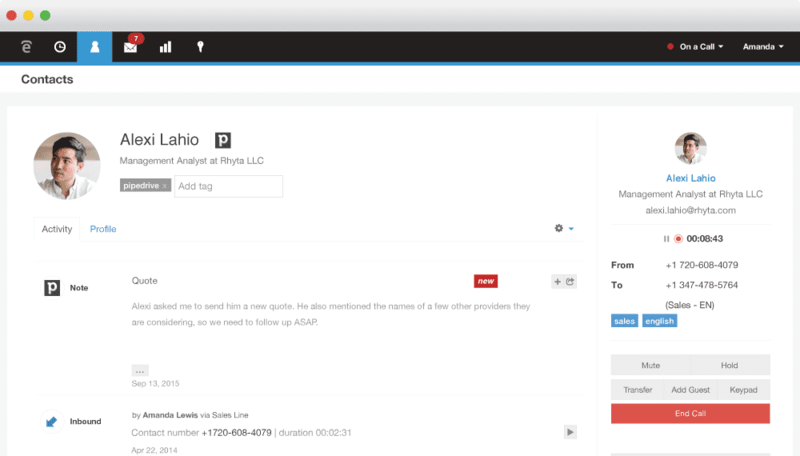 Pipedrive has a conventional CRM approach to sales pipelines. In other words, Pipedrive offers visual sales pipelines with custom stages and a drap-and-drop interface. The features for one pipeline exist for them all, meaning users have access to different views, forecasting, pipeline-specific stages and reports. 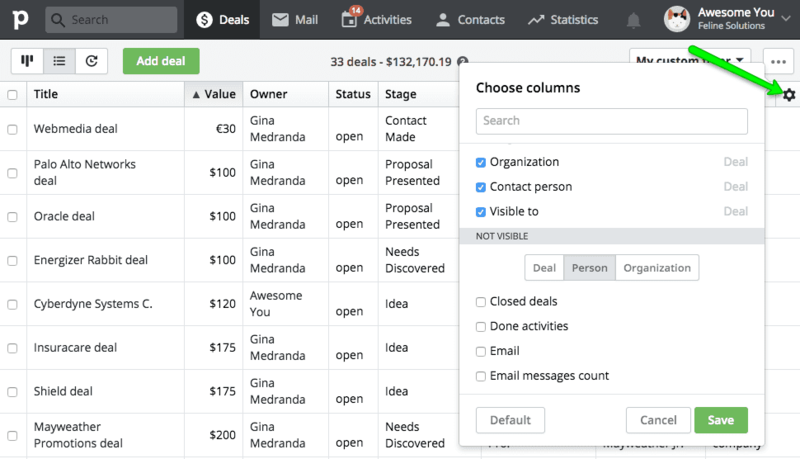 Users can access and edit deals by clicking on it within the pipeline; deals can be marked won or lost, discarded or moved to another pipeline simply by dragging it to the appropriate icon in the panel that pops up at the bottom of the screen. Pipedrive offers several automatic features that benefit in pipeline management. Users can create products, set a value, and attach them to a deal in increments so the deal value is automatically calculated based on their sum. Users can also define a deal’s probability of closing, and Pipedrive will weigh the value of those deals in its forecasts. Deal ‘rotting’ will automatically notify users when a deal has been inactive or neglected. In beta mode, web forms provide another channel for lead generation. Pipedrive also enables webhooks so notable changes (e.g. deals added) can trigger notifications for users or third party products. Pipedrive doesn’t directly enable email automation, although it integrates with third-party marketing apps. It also doesn’t enable automated task creation and assignment, as some sales automation solutions do. A visual sales pipeline has felt, at times, like a baseline differentiator between sales CRMs that go the extra mile and those that don’t. After all, what better way to gain a sense of your sales performance at a glance than to get a bird’s eye view of it? However, Close.io’s omission of this typical feature is almost certainly a design choice resulting from cost-benefit analysis; they left out a very common sales feature yet avoided a potentially cumbersome screen that its target users might not need. “High velocity” sales entail a short sales process, so who needs a pipeline when the sale might close the same day? That said, Pipedrive’s pipeline is not only ‘visual’, but it also looks nice and functions quite well. 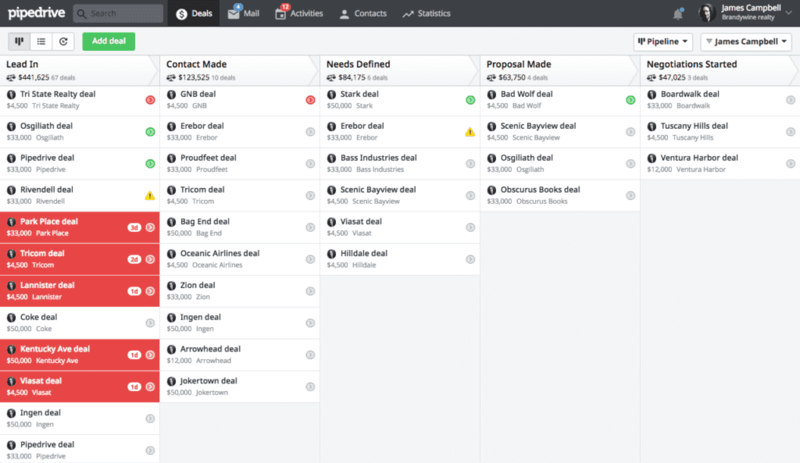 All the essential tools for modifying deals are a click away from the pipeline itself, along with tools to change to a list view for bulk edits. Meanwhile, optional features — such as deal “rotting” visual notifications, weighted forecasts accounting for deal closure probability and the ability to create ‘products’ with a fixed value, in addition to standard customization options — give Pipedrive users a fairly expansive range of pipeline management tools. When it comes to automations, neither Close.io nor Pipedrive offer some fairly common types of CRM automations — such as triggered record updates, task creation and assignment, or a wide array of custom notifications. Both solutions offer automatic notifications and reminders on certain fixed criteria, such as upcoming activities, missed tasks, task assignment. Close.io offers a limited range of email marketing automation while Pipedrive does not — but both integrate with more robust email marketing solutions anyway. While well-integrated email marketing features are great to have — and we’ll get into that in the next section — when it comes to pipeline management, the win goes to Pipedrive. A modern sales solution will integrate multiple communication channels to support an omnichannel sales strategy or simply to log, track, and report on which channels customers prefer. While calls, emails, and SMS are hardly the only channels customers use these days — social selling is a whole ‘nother ball game — they remain the most essential. Close.io offers VoIP call functionality right out of the box, which very few sales automation solutions do. Calls made through the software are included, which I haven’t seen elsewhere. This means that sales teams spending a lot of time on calls may save money using Close.io, as they may not require as expensive a subscription with another VoIP or cloud PBX provider. 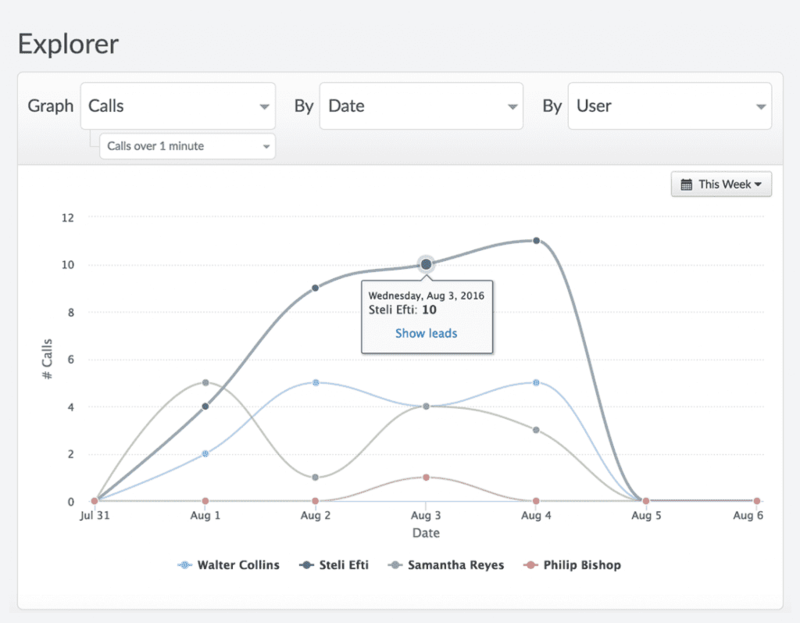 Close.io offers one-click calling, automatic tracking and logging, call transfers, forwards and recording, reports, notifications, voicemail drops, and features to streamline the process of calling one lead after the next. Note that Close.io integrates with Tenfold if users wish to manage their existing VoIP or PBX service alongside their CRM. Close.io also offers 1,000 free SMS per month, after which it costs $.01 per outgoing message. This feature is also built-in and requires no setup. Features include one-click sending, scheduled sending, tracking, reporting, and the ability to respond to incoming messages without leaving the Inbox. Their API enables bulk sending and importing activity from third-party SMS tools. As mentioned, Close.io offers email templates, tracking, and a degree of automation; users can segment their leads using Smart Views and send bulk emails with one click. Note that users must manually click the send button even when sending in bulk. Close.io offers email tracking, personalized templates, schedule sends, undo sends, snoozed emails, HTML customization, and the ability to set follow up reminders. Close.io integrates with many third-party email marketing services as well. Pipedrive offers full email sync, which means emails can be sent and received from within the platform (and emails sent and received from the synced email address will appear in Pipedrive), as well as a ‘smart BCC’, which associates external emails with relevant deals or contacts in the CRM. Correspondence associated with specific deals or contacts will appear in their activity timeline. If desired, emails sent from specific users can be made private. Pipedrive doesn’t offer call functionality out of the box, but they integrate with a few cloud communications providers (ranging from VoIP to cloud PBX). The best known provider on their list is arguably TalkDesk. Depending on the integration, users will be able to update and create notes, contacts, and activities in Pipedrive from within the third-party app. Suffice to say, users will need at least one app in conjunction with Pipedrive to gain call functionality features in their CRM. Pipedrive also enables other communication channels through integration. 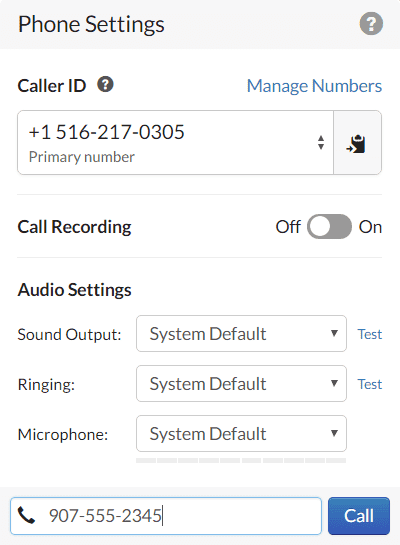 Call center software Nectar Desk offers call logging, SMS functionality, caller context, and the ability to add deal notes when using their app. Pipedrive also integrates with many popular third-party email marketing services. Channel integration may or may not be a priority for your business. Both Close.io and Pipedrive offer full email sync, meaning emails sent and received to your email address will appear in the CRM, and the CRM is capable of sending, receiving and logging emails on its own. Close.io offers more advanced built-in tracking than Pipedrive; users are able to see whether recipients opened an email, when they opened it, and how many times. Pipedrive’s email functionality meshes well with its other CRM capabilities, but it doesn’t provide this. 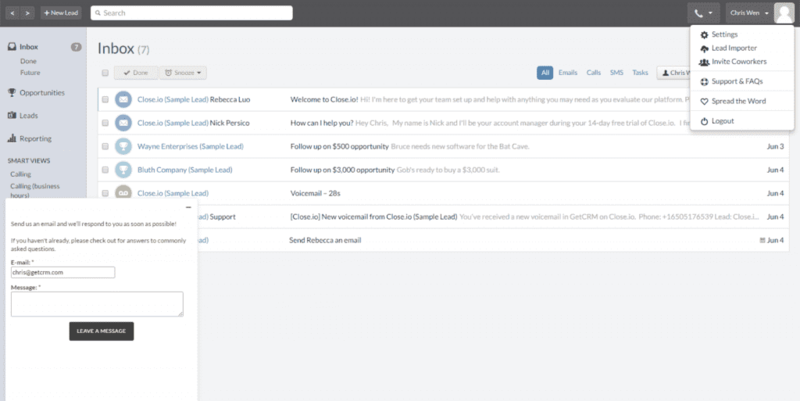 In addition, Close.io offers certain built-in email marketing tools. Granted, it doesn’t provide full-fledged email automation (like triggered emails or automated follow up sequences), but users can track and monitor recipient behavior and send bulk emails, which is better than nothing. The call functionality that Close.io offers is a big appeal, especially for sales teams that don’t need extra cloud communication functionality often included in VoIP subscriptions, like video conferencing or inbound caller ID. For teams that want the extra features of a VoIP provider, they could integrate their solution with Close using Tenfold. Pipedrive teams would need to build a custom integration using the Pipedrive API in order the integrate the VoIP provider of their choosing. The same rationale applies towards the two platforms’ SMS functionality — Close offers it built-in, Pipedrive might offer an integration with your preferred provider, and if not, you’re on your own. Again, the importance of these channels is relative to your sales process. For these channels’ integration, the win goes to Close.io. One of the most important benefits of a sales automation solutions is the capacity to review past sales activity and identify areas to optimize performance. Different solutions achieve this in various ways: some solutions offer a small array of built-in reports while others are far more robust with custom filters and dashboards. Close.io and Pipedrive both provide their own built-in reporting functionality and offer native integration with third-party reporting apps. Close provides built-in reporting on sales activity, performance, and CRM activity at a bird’s eye view as well as on the individual level over time periods. Various filters can be applied — for example, users can adjust the view according to time period, interval, deal value, deal status, lead status, and so on. Users can gain a sense of current pipeline health, forecasted growth, and areas where the team needs improvement. Sales managers can gain a broad view of how much time the team spends on calls, the distribution of customer data attributes, the value of deals closed per sales agent, and take appropriate action to optimize sales process and lead assignment protocols to ensure each agent is performing at the peak of their ability. Close.io integrates with a few third-party reporting solutions that enable custom dashboards using Close.io metrics, visualized real-time sales data with ‘win’ notifications or automatic generation of commission reports. Pipedrive provides high-level and closeup views of sales data in a variety of visual formats — bar graphs, pie charts, line graphs — with a variety of filters available according to user, pipeline, time period, and so forth. There are available default metrics — such as new deals added, average age of deals, number of open deals and so forth — and custom filters can be applied. Pipedrive is also able to show a sales split by product. If your business sells multiple products or services, key statistics can be shown specifically for each one. These can also have various default and custom filters applied, and can show the product performance by count, by value, per month, per quarter, and so forth. Pipedrive integrates with several third-party apps to extend its built-in reporting functionality for 360-degree views of customer accounts, automated sales competitions, real-time performance metrics, cash flow forecasting, and more. The quality of sales reports largely depends on the accuracy of the data. Close.io has more built-in features to ensure data integrity; however, what’s being compared here isn’t the likelihood of clean reports, but rather the breadth and flexibility of the reporting functionality itself. The only thing to do is assume equally accurate data. With proper training and oversight, this is as possible in Pipedrive as it is in Close.io, though there’s a bit more room for error with the former. Close.io provides metrics on every aspect of what’s possible in the platform, and then digs a little deeper — call functionality can be specified to ‘call duration’ then narrowed further into incoming calls, outgoing calls, or calls over one minute. Close.io provides similarly granular reports on user activity, email activity, lead and deal status changes, and so forth. Pipedrive has a bit more potential to create custom filters. Specific sales statistics can be visualized according to deals, contacts, activities, and products. While channel-specific statistics are lacking (as those channel integrations aren’t built in), activity reports are available through the third-parties apps that integrate with Pipedrive. So, in theory, Pipedrive users who are willing to use those integration partners for multichannel integration can obtain those reports as well. Pipedrive also integrates with third party business intelligence solutions for real-time performance analysis, forecasts, and more. Within the narrow scope of sales — particularly high volume sales centered around a small range of product lines or services — Close.io has a more robust built-in reporting capability than Pipedrive. I also prefer its reporting UI. However, for sales operations with multiple product lines that don’t mind maintaining a network of integrations for expanded functionality, Pipedrive can go broader — but it gets complicated. This isn’t to say its built-in reports can’t show quite a bit, because they can. It’s a close one for me, but if I am to evaluate a solution based on its built-in capability (as Integrations is a separate section), then I have to give the win to Close.io. There’s no business application that can fulfill all your software requirements. 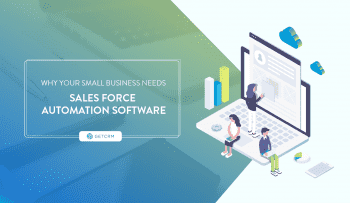 Invariably, you’ll need to integrate your sales automation solution with third-party software, whether for reports, invoicing, ecommerce, HR, and so forth. Close.io and Pipedrive both offer a library of integrations as well as API access for developers. Close.io provides over 27 integrations with third-party services across 14 categories. See the chart below for details, or visit their complete page here. Pipedrive provides over 80 integrations with third-party services across 10 categories. See the chart below for details, or visit their complete page here. Integrations by no means define the quality of CRMs, but the largest CRMs are known for their expansive library of quality partners. This is because, even in an ideal setting, a highly effective CRM performs well in a narrow range of functions rather than bloating itself with a wide array of half-fulfilled features. While integrations are never foolproof, it’s better to integrate effectively with a reputable third-party solution than to ineffectively attempt to replicate their area of expertise. As mentioned earlier, there is functionality that Close.io implements out of the box that Pipedrive does not — notably calls, email automation, and SMS. (As noted in the section Calls, Emails, SMS, Pipedrive offers 2-way email sync but Close.io goes farther.) So the fact that Pipedrive offers integrations to extend the platform towards that range of functionality doesn’t win it many points except in recognition that Pipedrive has (perhaps wisely) chosen to partner with a third-party rather than build their own native functionality. Nevertheless, as a platform unto itself, Pipedrive is a capable sales automation solution, and its range of integrations covers a bit more than Close.io. Even discounting the integrations that supply functions Close.io has built-in, Pipedrive gives you a few more options, too. Some of Close.io’s integrations have more brand recognition (very notably Zendesk). Going by breadth of functionality, I give the win for integrations to Pipedrive. Software is only great as long as you’re able to use it. No matter the efficacy of their platforms, some vendors go above and beyond to ensure their clients can access their data and essential functions, whether through uptime SLAs or multiple channels for customer support. While some companies streamline their tech support to keep prices low (by some measures) companies that offer quality support demonstrate their investment not only in their products, but also in their clients. Close.io offers an online knowledge base (available here) and the option for email support (support@close.io). The online knowledge base offers a pretty powerful predictive search function (note that the original developers wrote similar code for internal use at ElasticSales), and this goes a long way towards helping users help themselves. Otherwise, support articles are divided into categories, from General to category-specific like Email, Calling, SMS, Networking for VoIP, and so forth. Close.io makes available a Getting Started Guide and a Live Training Workshop, but when it comes to customer support after setup, it appears the knowledge base and email support are the only two options on any of their plans. Pipedrive offers a knowledge base with support articles divided by category, from The Basics to Billing to Administrative Set-Up. Their knowledge base has a predictive search function to help users find the article they’re looking for. For additional support, Pipedrive offers live chat via Zendesk, available Monday to Friday, 9 a.m. – 5 p.m. across EU and US time zones. For users concerned about system stability, Pipedrive posts the real-time status of components of its services. Note that for Platinum customers — the Pipedrive subscription being compared in this review — the account is given private hosting, assuring what the company can offer most in terms of privacy, security, and speed. Pipedrive dedicates a page informing prospective customers of their data security practices (“backups of backups”), which can be seen here. As for sales training, Pipedrive also offers a free two-week email training course called Sales Pipeline Academy. Some software solutions are made stabler than others, but whether or not it’s needed, the amount of technical or customer support a company is willing to provide indicates (at least partly) their opinion of their customers. It may be a testament to the confidence of the developers in the stability of their product that Close.io offers email support (although I’m told they’ve got great availability) to the exclusion of all other channels… but for a solution that’s fairly expensive, I think they could offer more. Live chat, maybe? On the other hand, Pipedrive doesn’t make their support email known, but they offer live chat through Zendesk. Presumably, once the ticket is created, the conversation can be carried out through email. Pipedrive makes their support availability known on their page. The Platinum plan includes dedicated hosting, which presumably could minimize potential problems requiring technical support. Close.io’s Professional plan and Pipedrive’s Platinum plan are comparatively priced per user month. At this price point, at face value, Pipedrive conveys more availability for their customers. Pipedrive’s dedicated hosting aside, it seems the relative customer and technical support options are the same across subscriptions. While the focus of this head-to-head is on the two specific plans, we shouldn’t disregard Pipedrive’s transparency and accessibility to its customers even at lower price points. The win for Service & Support goes to Pipedrive. Close.io and Pipedrive both offer three subscription tiers with escalating features and user storage. Check out details on their subscriptions below. As I often note in these head-to-heads, it’s a bit one-dimensional to evaluate pricing independently of what’s offered in each solution — but my consideration of which solution is a better value for money is left for the Final Verdict. Of course, no matter which solution is ultimately the best value, the point is moot if the software doesn’t meet your use case. Close.io is clearly more expensive than Pipedrive. Its cheapest plan is practically the same price as Pipedrive’s most expensive plan. If you’re an extremely budget-sensitive CRM shopper, then the win for pricing clearly goes to Pipedrive. It’s a very affordable CRM and it offers you considerable bang for your buck. Then again, you may be a little more price elastic if you’re able to consider Close.io and Pipedrive in the same breath. In this case, Pipedrive’s affordability is less the determining factor and more a selling point. Close.io is a very well-built solution and makes it a point to reduce traditional barriers, large and small, that conventional CRMs put in front of salespeople. But that brings us back to value for money, which is coming up in the next section. The win for pricing goes to Pipedrive. Close.io and Pipedrive are both sales automation solutions. The term ‘automation’ can have broad implications in the CRM space. For some solutions, it’s the ability to configure triggers and responses across CRM functions; for others, it’s the ability to move from one task to the next while the solution takes care of menial tasks that would have required data entry in the past. Close.io and Pipedrive both tend towards the latter. Close.io more strongly so; its ability to provide built-in email, calling, and SMS functionality out of the box without setup is rare in this space. The minimization of data entry is a prominent selling point for the software, but it doesn’t stop there. The UI is designed to produce a seamless user experience, and the most essential functions are never more than a couple of clicks away. Sales agents could easily spend the majority of their work-related time in the app, and this is no small feat; one of the biggest challenges for a CRM is user adoption, and of the many solutions I’ve evaluated, few provide as intuitive and seamless an experience for essential tasks as well as Close.io. This is heady praise, yet you’ll notice Pipedrive won most of the categories in this head-to-head (a total of 4-3). I think this is deserved, though a few of its wins were close. 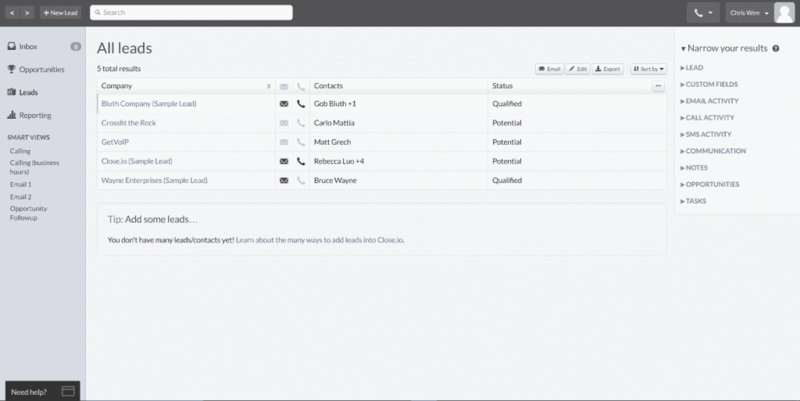 Pipedrive simply tries harder to be more expansive for conventional CRM use. While the CRM space is hardly static, and innovation is abound, business software investment is prudent — keeping one foot planted in the known, rather than jumping with both feet into the promising unknown. For companies switching from another conventional CRM, Pipedrive represents a safer and cheaper bet with a competent UI for a steady, if slower, sales process. This is also supported by how Close.io bills itself as a solution for high velocity inside sales teams. Almost by definition, inside sales agents spend a lot of time at their station making calls, sending emails, and SMS — ‘high velocity’ indicating they’re pursuing and closing deals in high volume at a fast pace. For these teams, a central sales platform that stays out of the way and fulfills its role without much user input is a cherished resource. Close.io outperforms the competition in this regard. You’ll note the two categories it won (UX/UI and Calls, Emails, SMS), it won handily; it put up a strong showing in other categories and only really fell short in Pricing and Service & Support. As for Pricing, it’s worth mentioning that companies that can adapt their processes around this solution may find themselves saving money on other business apps or services (notably an existing VoIP subscription), which may help offset the cost. So a head-to-head comparison by conventional CRM standards doesn’t really benefit Close.io. The use cases that would benefit most from Close.io are, as mentioned, inside sales teams, primarily B2B products and services, particularly those whose agents are hampered by using several external applications for communication. Close.io doesn’t offer a mobile app, which is a notable shortcoming; however, agents who work mainly from the office using Close.io won’t need one because the call functionality is so readily available that’s it’s more convenient to call using a headset than a mobile device. For businesses with a slower sales process — where sales are clearly defined by stage — internal processes entail more oversight over agents’ work, and agents sometimes work on the go using a mobile app. In this case, Pipedrive is a steadier option. It requires more data entry, but its customizability suggests it could be adapted to a broader range of roles. Businesses using Pipedrive should expect to require third-party apps to fulfill related needs, like email marketing or call functionality, but they likely already do. In short, Close.io knocks it out of the park for teams that conduct a high volume of sales from a workstation that doesn’t often entail face-to-face encounter. Pipedrive is a safe, affordable, capable solution for a wide variety of use cases, including direct sales, as its customizability and mobile app enable agents to update their data on the go — however, there’s more data entry required and they’ll need to pay attention to clean data practices. If you’re in the market, they’re both worth their 14-day free trials. Looking for a sales automation solution? Check out our free sales CRM comparison guide.